As industry expectations for data processing grow increasingly rigorous, many companies have turned to microservices as an alternative to a monolithic application framework. By decoupling various services and allocating each individual service to its own database, microservices allow companies to facilitate faster time-to-market for new applications or updates. Employing microservices gives companies the opportunity to find the most efficient database for each service they offer — and microservices are light by design, which minimizes their database footprint while maximizing their agility. Before you adopt a microservice architecture for your company, make sure to consider the following components: read performance, write performance, latency, resource efficiency and and provisioning efficiency. You should also decide whether your microservices will require data stores for transient data, ephemeral data, operational data, transactional data or — more commonly — some combination of these. The metrics for each of these components will vary based on the services you provide, so make sure to check out our ebook to determine your performance, latency and data store needs. There are more than 300 databases out there, so it’s important to thoroughly evaluate your microservice needs before moving forward with any particular platform. In selecting a database for the microservices you would like to provide — which could include anything from product catalogs and order processing to customer profile management and real-time fraud detection — it is important to design every service to provide the best throughput. This way, you’ll avoid any individual microservice creating a bottleneck and consequently collapsing your entire system. Be careful to avoid “microservices-washing,” a fraudulent attempt to rebrand monolithic frameworks as microservices. Given all of these considerations, Redis Enterprise is the best option for your microservice needs. Redis Enterprise is built over the open-source Redis database, designed by Mountain View-based Redis Labs, and comes with RediSearch, ReJSON, RedisGraph and Redis-ML modules built in. It supports a variety of data structures — from Sorted Sets and Geo-spatial Indexes to Hyperloglogs and Streams — which means that you will almost certainly be able to find the data structure that best suits your performance requirements. Redis Enterprise simultaneously offers a higher throughput and lower latency than other popular NoSQL databases, and can be configured for any type of data store utilized by a microservice. As an active-active distributed database based on CRDTs, Redis Enterprise has created multiple methods for microservices to share datasets between them. Redis Enterprise also has a flexible deployment model, so microservice designers can launch Redis Enterprise in their own data centers, containerized Kubernetes environments or in a cloud-native/PaaS environment. Finally, Redis Enterprise’s architecture is highly reliable with always-on availability and immediate failure detection, so designers can count on Redis’ constant support without having to worry about data loss. 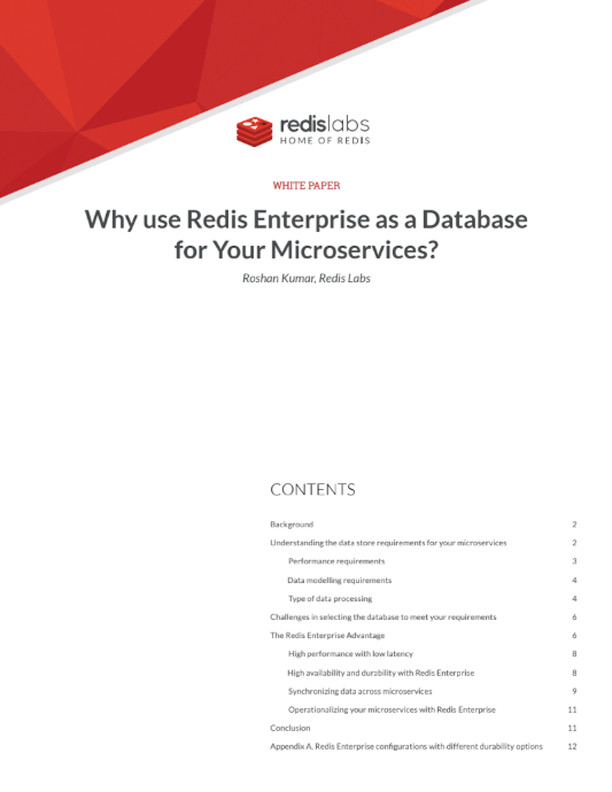 To find out more about how you can operationalize your microservice offerings with Redis Enterprise, please download the ebook.